After going back and forth deciding whether to attend to her friend’s wedding, Eloise McGarry (Anna Kendrick) finally decides she will go. When she gets to the reception, she finds that she has been assigned to Table 19. The table is in the farthest corner of the room meant for people who were only invited out of obligation. When Eloise takes her seat at the table, she is surrounded by other outcasts. Jerry and Bina Kepp (Craig Robinson and Lisa Kudrow) are restaurant owning friends of the bride’s father. Jo Flanagan (June Squibb) is the bride’s former nanny. Walter Thimble (Stephen Merchant) a cousin has been granted leave from a halfway house to attend. And Renzo Eckberg (Tony Revolori) is a kid looking to either find love or at least hook up. As the night progresses, the group tries to manage their way through all sorts of pratfalls, from Eloise’ mysterious man she meets at the reception, to her dealings with her ex-boyfriend Teddy (Wyatt Russell), who just happens to be the bride’s brother. There is even a wedding cake mishap. The randoms help each other through everything they encounter, forming an unexpected bond. 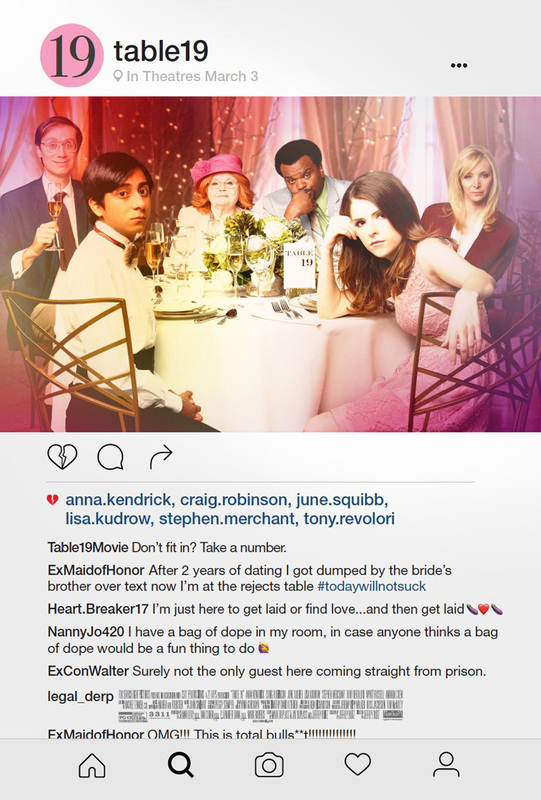 From the previews and with a cast including Anna Kendrick, Stephen Merchant, Craig Robinson, and Lisa Kudrow, I was expecting Table 19 to be a funny take on weddings. What we got instead was a mess of a movie that provides a few funny moments, but sticks mostly to standard wedding movie tropes and no real focus. Overall the cast is fine. Unfortunately, they aren’t given much to work with. Craig Robinson and Lisa Kudrow are relegated to a bickering couple who are both unhappy in their marriage and have been for some time. Stephen Merchant’s character is just odd. The writers tried too hard to make him quirky but instead gave us a character who does little more than give elusive answers when asked about his life. Tony Revolori’s character gets old quick as he tries again and again to find someone to fulfill his desires. June Squibb’s character is supposed to be the “wise” one, which she is, to some extent. I guess. The lone standout is Anna Kendrick. She lets her charm shine through where she can, but, again, the character is a stretch at times. Table 19 wants to be both hilarious and touching. It never really achieves either. The story is disjointed and all over the place. It never really gets any momentum. The characters have no real reason to attend the wedding. Why would an incarcerated cousin or the teenager looking to hook up even be invited? The reveal of Anna Kendrick’s character feels forced and really makes no sense. I wanted to like Table 19. I wanted it to be a funny escape. Unfortunately, it wasn’t. It runs just shy of an hour and a half, which is good, but it felt so much longer. I would recommend choosing something else if you’re headed to the movies. If you’re looking for a comedy, though, you may be stuck with this one.